While each type of wood product, from paper to firewood to veneers, has a different supply chain, furniture provides a good example of where wood comes from. Much of the bulk-produced wood furniture sold in the United States is manufactured in Asia. The wood to make these products comes from countries including Russia, Burma, Indonesia, Papua New Guinea, and many small countries in the Amazon. In many of these countries regulations are weak and illegal and unsustainable harvesting are common. Forgery, bribery and negligence allow very high percentages of illegal wood to enter the wood supply chain that manufactures products imported to the United States imports from Asia. Illegal harvesting and deforestation in these areas devastates the forest and impacts the local communities that depend upon it, contributing to flooding, fires, drought, and depletion of food and fiber resources. The loss of biodiversity is significant from an ecological standpoint but this deforestation also reduces the game species that native peoples often depend upon for sustenance. Demand from western countries such as the US supports and drives these forest practices; our purchases of products produced from this flawed supply chain are implicated in unsustainable harvesting happening far from home. 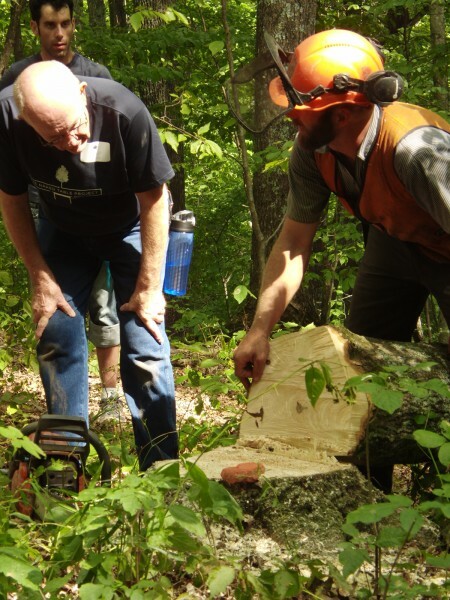 By choosing locally grown and/or certified wood and wood products, your dollars can vote for good forest management and fair treatment of those working to grow and harvest the trees you use every day. Where can you find TFP products? As we grow and you can expect to see more of your local wood products with raw material that comes from landowners and forester of The Forest Partnership. Ask for locally grown and certified products and find out where your wood is coming from. The Forest Partnership is proud to present to you our logo. If you see our logo it is a guarantee that the wood is certified and locally grown by landowners in Vermont and its surrounding states. The alternative to many traditionally wood-based products are petroleum-based that cause natural resource impacts, adversely impact human health, involve infringement of landowner and local community rights, are produced en mass production in overseas factories, and leave a general disconnectedness between those using the products and those producing them. Wood is a sustainable resource if forests are managed well; by choosing to buy wood products from locally grown, third party certified forests you can be assured that the forest are being treated well and that your dollars are supporting rural communities and the jobs that feed and clothe those working in forested regions.